Caption: Harry Wilson, George Gardner, Granville, Bauer, Chess Greer, Jess Beason and daughter, Nora, Clayton Bauer, and Earl Lockman. Circa early 1900s. Courtesy Clayton Bauer collection. 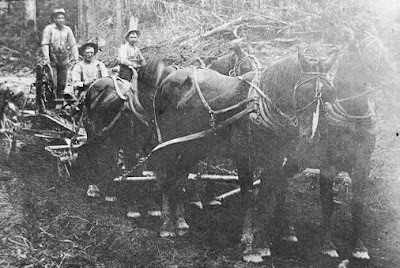 While the forest service was employing men and beginning their struggles to manage the public land, the earlier homesteaders were confronting Sanders County Commissioners in Thompson Falls, asking for better roads. In March 1907 county road District No.7 included territory from Smeads Spur to Martin Creek on the South side of the Clark's Fork River and from Bull River to Rock Creek on the north side of the river. When the commissioners met June 4, 1906, they reviewed reports from the men in charge of several road districts in the approximately 115 mile-long county. Homesteaders who lived in the farflung towns were accustomed to taking the train to Thompson Falls to attend the meeting and advance their needs. On that day, Thomas Evans, who lived in District No. 7 near Noxon, appeared before the commissioners and asked permission to straighten the road across his land. His request was approved, with the stipulation it was to be at no cost to the county.1. In September 1906, people from Heron approached the commissioners to build a bridge across Elk Creek. The lawmakers did approve spending $400 to build a road from Trout Creek north. In December the railroad requested a road change at Noxon. The commissioners referred the matter to Beebe to investigate and report. G. A. Brown requested a road be built near Noxon. His request was granted, but no more than $100 was allowed for the road. J. H. Gorbett also requested a road, and I. R. Blaisdell, Isaac Engle and Ed Hampton were appointed to view it on December 20. John Hayden's request concerning his road near Noxon was laid over. During that time, C. E. Baker was sheriff, and undoubtably also appreciated the need for better roads. Road building crew near Noxon in early 1900s. Bob Jenkins, Marion Cotton, with Jim Finnigan driving the team. Courtesy William Finnigan collection. The spring of 1908, George Baker and Frank Berray got an idea to make a little money and improve the Bull River road at the same time. They got three people who lived in that valley interested and the group rode their horses down the valley, crossed the Clark's Fork on Smeads ferry, then took the train from Noxon to Thompson Falls. There they talked to the county commissioners, petitioning them to create District 8 to include the Bull River country in Sanders county. On March 8, George Baker, who claimed Heron as his residence, became Bull River road supervisor. Robert Anderson was the road supervisor from Martin Creek to Smeads; Royal A. Chapel was the supervisor of roads from Smeads to the Idaho State line. Anderson and Chapel lived at Noxon. Bull River received $100, Noxon and Heron each $200 for road work. The Board admonished all road supervisors to get along with this roadwork as cheaply as possible. In August, Royal A. Chapel resigned as road supervisor and F. P. Allen was appointed to replace him. Travel was only by foot or horseback along the old Kootenai Indian trail on the north side of the river across from Noxon as there was no road. There was a rudiment of a road along the south side, carved out of the wilderness in the late 1870s and early1880s for supplying the railroad construction and improved upon by settlers: Only as necessity required and the county commissioners could be prevailed upon to provide scant funding for. Roads might be rough, winding and rocky in the mountains but that didn't stop determined homesteaders from harvesting nature's bounty. Mr. and Mrs. Knott and their daughters hitched up their team and wagon and headed into the Bull River country to pick gallons of huckleberries and haul them home to preserve for winter. The Knotts, who lived at the mouth of Elk Creek near Heron, made their arduous way over the county road on the north side of the Clark's Fork River. The Smeads ferry carried them and their team and wagon across the river to where they travel the wagon trail to the 'Horse Thief Rangers' cabin. There, they planned to spend the night. But it was full of pack rats. So they backtracked to Cap Berray's ranch and spent the night, sleeping in the haystack. The next day they went up Star Gulch to Squaw Peak and picked enough berries to fill their containers before heading for home. 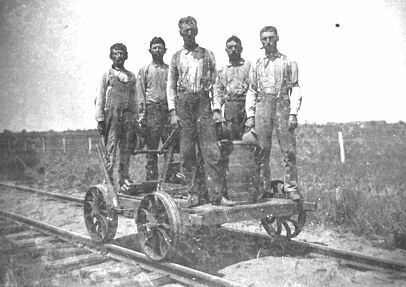 Many men found employment with the railroad maintenance crews stationed at Cabinet, Heron, Noxon and Trout Creek. Seven or eight were employed at Noxon in 1908. The men rode a scooter, hand pumping it along the track to their work location. Sometimes a trailer was pulled and used to work from. Railroad gang on a pump car. Courtesy Blanche Gordon Claxton collection. Paul Nanny and Mr. Matt (called 'Mat the Jap'), were on the section crew. Matt was an Oriental who lived at Noxon with his wife all his life. Both he and his wife were accepted and respected, and enjoyed the same station in life and the community activities as did the majority at Noxon during a time when Orientals were often being scorned in the United States. Mrs. Matt worked in Ethel (Fulks Greer) Bartholomew's cafe. Nanny remained a bachelor. Freight began trickling into Noxon on the railroad. The early settlers never envisioned that in less than fifty years it would become so numerous it sometimes took up to two hours to unload the trains. Everything came into town by way of the 'local', 'Dinky', or 'Galloping Goose', whichever name one chose to call the short train serving the area from Spokane to Paradise. In January, 1909 Noxonites were petitioning the county commissioners for the railroad depot agent, O. C. Matheny, to be appointed Justice of the Peace of Smeads Township.1. Matheny and Red Cherry lived on a place up Pilgrim Creek, back of the cemetery. The Great Northern railroad hired Swan Swanson and a crew to survey upper Bull River valley, with a view towards putting in a railroad route to Troy. The Northern Pacific railroad was surveying the southern end of Bull River valley at the same time, for a railroad route to connect with their line at Noxon, which was separated by a range of mountains. The NPRR owned every other section of land throughout both the Bull River and the Clark's Fork valleys. Most of it was heavily timbered and there was still some interest in mining in those mountains. The NPRR published Pamphlet No.1, extolling the virtues of homesteading in Sanders County. It was widely distributed. More people came to the valley.